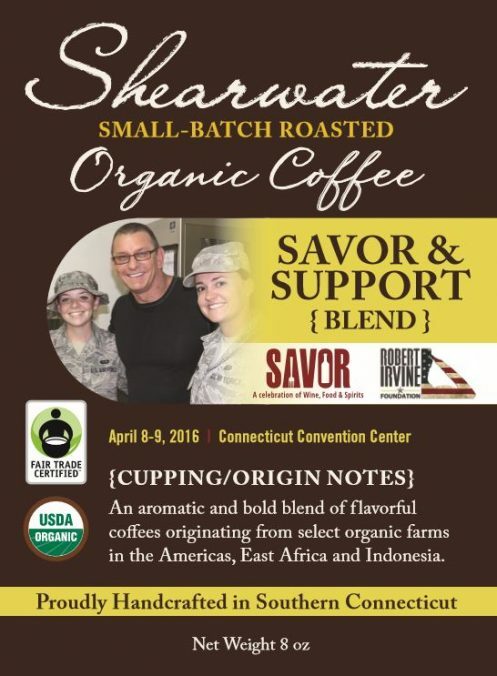 The Robert Irvine Foundation Donate and Shearwater will send you a bag of Savor & Support Coffee Blend. Savor & Support Blend is an aromatic and bold blend of flavorful coffees originating from select organic farms in the Americas, East Africa and Indonesia. Savor & Support Blend was created for Chef Irvine & the SAVOR CT 2015 & 2016 events to raise financial donations to The Robert Irvine Foundation. The Robert Irvine Foundation is a not-for-profit, 501c3 organization that honors the men and women defending our country, first responders and the many other heroes in our lives. The Foundation’s mission is to support individuals and organizations committed to enriching the lives of our heroes and their families.